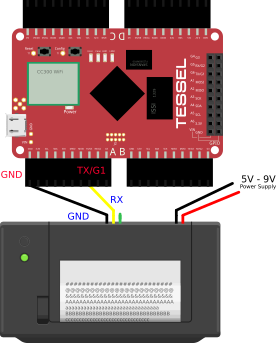 Support for the A2 micro panel thermal printer with Tessel. Needs a seperate 5v - 9V, 2A power supply. The Tessel can't power this. 9V is faster. You can do a test print by holding the printer button while powering. A, B, D ports only. C doesn't support UART yet. Use A, B, D ports. C doesn't support UART.